There are thousands upon thousands of questions that crop up when you are building your log home. We are always available to answer any questions that may arise either through email or by phone 250-791-6683. One handy tool we have discovered is a book called The Illustrated Guide to Log Home Construction - From Log Shell to Finished Home. This very unique book focuses exclusively on converting the log home shell into a finished log home. There is no other book like this on the market today! 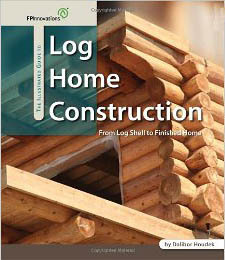 It is a must-have "how-to" guide for log home builders, general contractors who finish log homes, designers and architects, students and do-it yourself log building enthusiasts. It covers detailed provisions right from the foundations to ensure that the sill log will be tightly sealed, all the way to the installation of kitchen cabinets in a manner that will allow the logs to settle without damaging the cabinetry. Each chapter of this book depicts one aspect of the log home finishing process and provides several options using a diverse selection of techniques and products available today. Three dimensional color drawings depict the placement of sealants e.g., gaskets, wind-proofing membranes and vapor barriers, and explicitly show how to use and install them so that they effectively perform their function. Dalibor Houdek was introduced to log building construction at the Pat Wolfe Log Building School in Ontario in 1993. In the following year, he received his engineering degree in timber construction and started his own log and timber frame building company. Subsequently, he earned a Ph.D. for his work on the fire performance of handcrafted log walls. Since joining Forintek Canada Corp., now known as FPInnovations , Houdek has assisted dozens of log building companies with improving product performance and increasing productivity in the log building yard. He is an active member of the International Log Builders' Association where he also served as a Director, and a Vice President. He has co-authored two other books on round log construction, and frequently presents on log and timber construction throughout North America and Europe.